Performances | June 1, 2013 | by Missy Pfohl Smith. 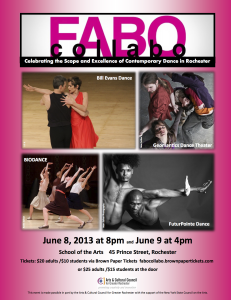 BIODANCE premiered D. Chase Angier’s Letter to the World 1.5 and reprised Smith’s No Dancing Allowed on June 8 and 9, 2013 at School of the Arts in Rochester, NY. BIODANCE was honored to share this collaborative bill with Bill Evans Dance Company, Futurpointe Dance, and Geomantics Dance Theater.